Polycystic Ovarian Syndrome, or simply PCOS, is one of the most common conditions affecting the endocrine system in women. PCOS results from hormonal imbalance, causes issues to a woman’s menstrual cycle and consequently leading to infertility (Hart et al, 2004). Other effects of PCOS include acne, weight gain, excessive hair growth, and when left untreated over time, the condition can lead to more severe ailments like heart disease and diabetes. Numerous women with PCOS take a wide assortment of medications for managing the symptoms of the condition. While these medications can help alleviate some symptoms, they are also known to cause irritating side effects such as exhaustion, diarrhea, nausea and vomiting among others. This makes it necessary for PCOS sufferers and medical practitioners to seek safe alternative means that can effectively address PCOS at its root. Acupuncture, Chinese herbal medicine, as well as nutritional protocols, remarkably help women with PCOS manage symptoms, regulate periods as well as improve their chances of conceiving and delivering a healthy baby (Ma et al, 2014). It is important to first understand what PCOS really is. 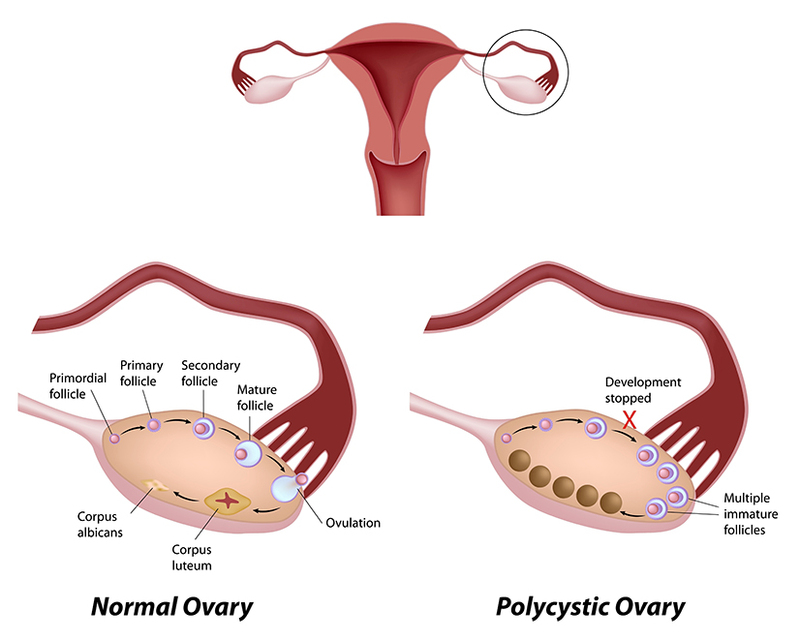 Polycystic ovaries: As the name suggests, polycystic ovaries is a condition whereby the ovaries become bigger and have numerous follicles or fluid-filled sacs. Naturally, a normal ovary has a large number of small harmless sacs where the eggs develop. In women diagnosed with PCOS, the follicles usually fail to release an egg and consequently, there’s no ovulation (Hart et al, 2004). Excessive androgen: PCOS results from hormonal imbalance where the woman has greater than normal levels of androgens, which are regarded as male hormones. As such, women with PCOS are bound to have some male characteristics such as excessive body and facial hair (Azziz et al, 2009). Irregular menstruation: Periods become irregular because the ovaries fail to release eggs regularly. According to the UK Medical journal, The Lancet, PCOS effects up to 10 percent of women in child bearing age (14 to 49 years). However, as many as more than 50 percent of PCOS cases are not diagnosed and thus millions of sufferers do not actually know that they have the condition. Shockingly, PCOS is the biggest cause of infertility in women. An estimated 70 percent of women with malfunctioning ovaries have PCOS and thus experience difficulty getting pregnant. Research results also indicate that about 40 percent of diabetic women aged between 20 and 50 years have the condition. Other studies show that PCOS is passed down genetically. If a woman has PCOS, there’s a 50 percent chance of her daughter also having PCOS. Irregular menstruation and some women may miss periods in totality. Infertility resulting from difficulty or irregularity in ovulating. Hirsutism or excess hair growth, particularly on the chest, face and buttocks. Some women experience weight gain even though other PCOS women can be lean. Women with PCOS and diabetes usually demonstrate insulin resistance. Women usually go to a doctor complaining about the absence of periods, difficulty in conceiving, excessive hair growth, weight gain, and unsightly acne among other symptoms of the PCOS disease. Many practitioners don’t comprehend polycystic ovarian syndrome and usually administer medications for managing the various symptoms rather than addressing the root cause of the problem. Treatment usually involves hormonal therapy usually through birth control pills, drugs for lowering androgen hormones as well as other drugs for managing hormones. There are also drugs for reducing resistance to insulin. Doctors may also recommend surgical operations for some cases and this poses a substantial risk of scarring. Current treatments of PCOS in Western medicine generally focus on managing the symptoms and regulating hormones linked to the condition (Nestler, 2008). Western medical treatments for PCOS are largely ineffective, result to unwanted side effects in the long-term, require protracted indefinite usage and can take an economic toll on families because they’re pricy. Reducing the size of the ovary as well as decreasing the number of ovarian follicles. Increasing the regularity of periods. Reduction of insulin resistance and regulation of blood glucose. Normalization of ovulation through stabilization of estrogen cycles and reducing testosterone amounts. Increasing blood flowing to the ovaries. Helping lower cortisol amounts and losing weight. A study by Swedish researchers and published in Nature Magazine (2009) yielded results showing that acupuncture effectively deals with PCOS at its root, balancing hormones related to the menstrual cycle, reducing sympathetic nerve activity in women with polycystic ovarian syndrome (PCOS). The researchers backed acupuncture as a safe and effective treatment for polycystic ovarian syndrome with no side effects. According to research, acupuncture results in more frequent and regular periods, decreased testosterone levels and an improvement in body mass index (Zheng et al, 2013). If you have been diagnosed with PCOS, call us to schedule a free consultation and let us show you how we can help. The Acupuncturists have had much success treating this condition and we are confident that we can help you too. Hart, R., Hickey, M., & Franks, S. (2004). Definitions, prevalence and symptoms of polycystic ovaries and polycystic ovary syndrome. Best Practice& Research Clinical Obstetrics & Gynaecology, 18(5), 671-683. Ma, H., Quan, X., Li, J., Wang, B., & Chen, X. (2014, May). Acupuncture for PCOS: A systematic review and meta-analysis. In Electronics, Computer and Applications, 2014 IEEE Workshop on (pp. 800-804). IEEE. 2014 IEEE Workshop on (pp. 800-804). IEEE. Nestler, J. E. (2008). Metformin for the treatment of PCOS. New England Journal of Medicine, 358(1), 47-54.